Add class and comfort to your outdoor living with the stylish artistry of Aquatica’s new Alabama Furniture range. For it has been designed and manufactured to give you luxurious comfort, and bring elegant yet very contemporary good looks into your garden, back yard or patio. Alabama brings together streamlined, upscale chic with thoughtful function, to produce a trio of modern, glamorous furnishings which would grace any outdoor space. Each piece unites the pared back simplicity of crisp, clean iroko wood frames, softened by cushions that invite you to stay a while and relax. Central to the set is the chic, contemporary sofa with comfortable seats and compacted dimensions to satisfy every space and style requirement. 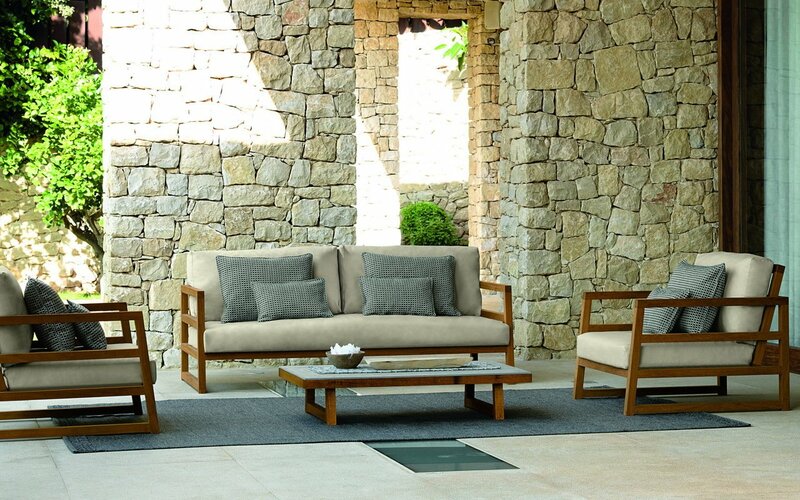 The sofa is complemented by an equally sumptuous, matching, standalone outdoor armchair with arms and a handsome coffee table with its 8 mm fiber cement top. 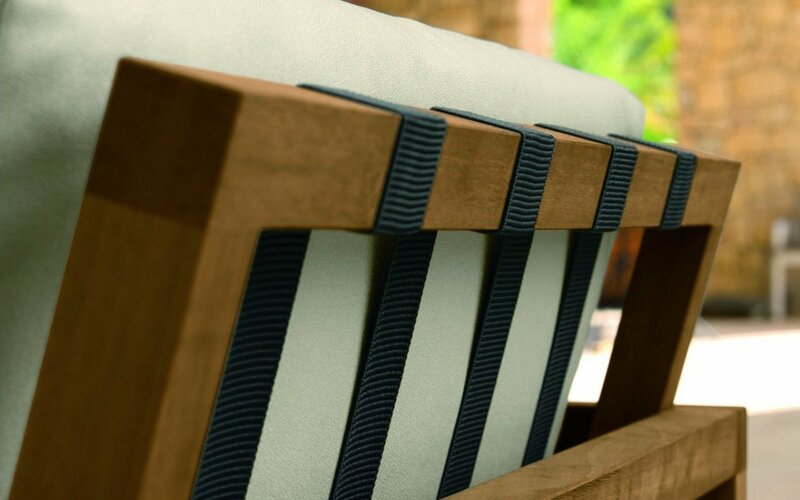 Sofa and seats are supported by polyester belts specifically formulated for outdoor use and coordinated to the frame colour. 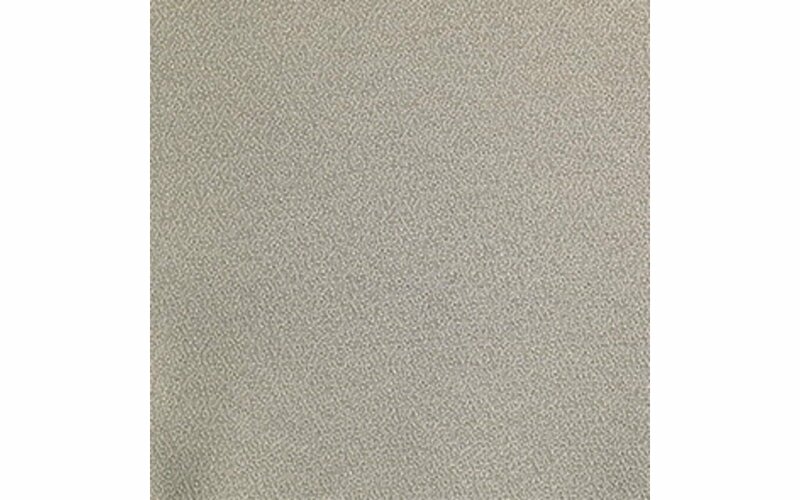 Alabama’s stylish presentation relies in large part on the clever combination of natural tones, subtle fabric hues and the modern urban chic of the brushed, powder-coated frames. The first option takes the rich, warmth of Iroko wood for its frame and combine this with plump, soft, understated beige fabric cushions offset by coordinating dark grey belts for the back rest. If you prefer the harder edged look of powder-coated aluminum, choose either the crisp, clean lines of our white furniture, beautifully finished by a slim teak slat on the top of the arm rests and lower back frame. This pairing is completed by the smart Palmera ‘industrial’ grey tones of the cushions and the lighter grey straps which form the back supports of the cushions. 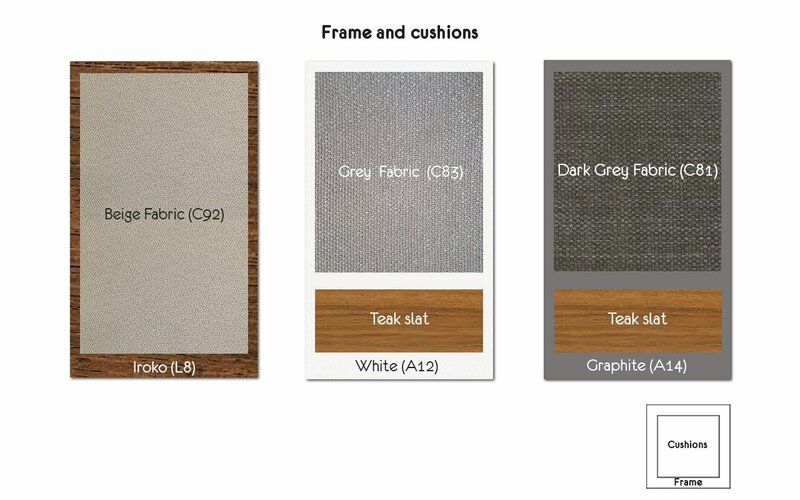 Our last option is just as stunning – smoky, sultry powder coated graphite, also with the finishing touch of the teak slat trim, matching Palmera dark grey cushions and dark grey belts which merge to create very sophisticated outdoor impact. 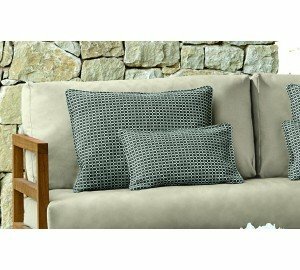 Palmera dark outdoor pillow 23.5"x15.